Her DIY know-how and innate creativity are two of the many reasons why we invited Herz und Blut founder Jules Villbrandt for an evening on gift wrapping to learn her tricks of the trade—wrapping tips she details in her beautiful blog article (in German). Together with her blogger friends and a bottle of Glühwein, she showed us how to add a touch of originality to presents with JUNIQE wrapping paper. We also chatted with her about what she likes to gift, what’s on her wish list this year, and where she finds her inspiration. Growing up in the countryside, Jules developed an eye for the various elements of nature, studying them, appreciating them, and using them to craft wonderful, new objects. 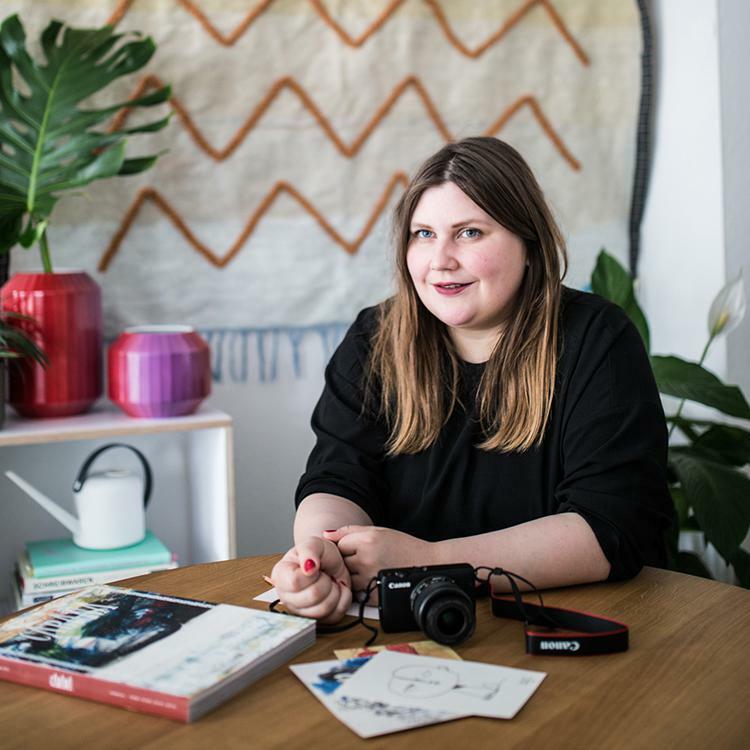 When she moved to Berlin’s Wedding district, she devoted herself to her passions—photography, beautiful interiors and sophisticated accessories—in the capital's flea markets and cafés. What used to be a hobby, taking photos of my friends’ street styles, has gradually become my profession. These passions are documented and featured on her blog and online magazine Herz und Blut (Heart and Blood), where she shares her beautiful shots of exceptional places, captured in minute details—from fresh bouquets to unusual wall art. I love taking pictures! A blog is a great platform to tell the stories of fascinating people and interesting things. What’s your favourite occasion for giving presents? Anyone who knows me a little, knows that I like to give. My gift of choice? A bouquet of flowers. It doesn't always have to be for a specific occasion. Of course birthdays and baby showers are perfect, but giving someone a present unexpectedly, just because, is the best. I also have a little present cupboard at home, in case I have to improvise. What’s at the top of your personal Christmas wish list this year? To be honest, I just want to take a little break, take advantage of the festive season and do nothing. With my feet up, of course—that would be great. And it may seem a bit cheesy, but I do sincerely hope that all my loved ones are healthy. You can’t put a price on that. What gift trends have really won you over as a lifestyle blogger? What will be under people’s Christmas trees this year? I think that traditional gifts, such as cashmere jumpers or perfumes, will never go out of fashion. Christmas is also the perfect time to gift beautiful ceramics or little bits and bobs from all over the world. Less is more, that's for sure. How are you tackling your Christmas shopping this year? Any insider tips? Since I spend a lot of time on the internet, I get a lot of inspiration throughout the year. I use Pinterest a lot and I also bookmark pages on Instagram I like, to save them for later. But this year, the joy of shopping is coming directly to Herz und Blut—we’re organising a pop-up store in our studio from December 8th to 17th. Other than that, I must admit I always love Berlin’s famous department store KaDeWe at this time of year. Choosing nice wrapping paper is half the battle. What’s the best present you've ever been given? Oh, I’ve received many wonderful gifts. But I must say, my lovely friend Chrissi really surprised me recently with tickets to see The Streets. So awesome! What's the trickiest gift you've ever had to wrap and how did you go about doing it? Let's face it—at the end of the day, everything can be wrapped. But the sweet trick is always a winner. Just add a ribbon at each end, et voila. What’s your favourite JUNIQE wrapping paper? I think the leopard wrapping paper is the best. It’s got something classy to it that reminds me of Versace in a way—it’s sophisticated. Got any advice for our readers before they embark on their Christmas wrapathons? Please share! There's no trick, really. I would say that choosing nice wrapping paper is half the battle. And, for DIY fans, adding handmade gift tags, or branches from a walk in the forest can really add a personal touch and a sprinkle of magic.